Some random wild and crazy thoughts while wondering what’s the line that the Boss will play Rosalita (Come Out Tonight) at the Super Bowl. Kurt Warner, whose Cardinals face the Steelers in Super Bowl XLIII, joins Craig Morton as the only quarterbacks to lead two different teams to the Super Bowl. Morton was terrible in both his starts, with seven interceptions and less than 200 passing yards total in two games. He lost to the Colts, 16-13, while quarterbacking the Cowboys in Super Bowl V.
Seven years later , Morton threw four interceptions before being replaced by Norris Weese as his former club, Dallas, slashed the Broncos, 27-10, in Super Bowl XII. Warner fared much better. He threw for 414 yards and two touchdowns and was named MVP in helping the Rams beat the Titans, 23-16, in SB XXXIV. Two years later the Rams lost to the Patriots, but Warner still passed for 365 yards and scored on a two-yard touchdown run. Pittsburgh QB Ben Roethlisberger resembled Morton more than Warner in his only Super Bowl appearance. Despite a miserable 9-21, two interception performance, Roethlisberger did rush for a touchdown as the Steelers beat the Seahawks, 21-10. SB V Att. Comp. Yds. TD Int. Is it me, or are we advancing beyond comprehension through the annual use of Roman Numerals to designate Super Bowls? Do the math. Hey listen, I took four years of Latin in high school, but I got lost around about XXXIX. Only 13 of the previous 42 Super Bowls have been decided by seven points or less. And in the last seven years, all four Patriots’ Super Bowls, including the 17-14 loss to the Giants last year, were decided by field goals. The Pats won the other three. The NFC holds a slight lead over the AFC, 22-20, in Super Bowl titles. The NFC won 13 straight between SB XIX and SBr XXXI; the AFC has won eight of eleven championships since then. My multi-petaflop supercomputer crunched the numbers and spit out the result: Cardinals 27, Steelers 24… in overtime. Who are you rooting for Sunday, Cardinals or Steelers? Actually, I’m rooting for a good Super Bowl game with historic ramifications. Overtime would practically guarantee both. I have little rooting interest in either the Cardinals or the Steelers. Oh sure, the Cardinals would be a Cinderella story. It’s like having the St. Louis Browns… or Tampa Bay Rays…win the World Series. But I don’t know a single person who is an Arizona Cardinals fan. On the other hand, I know plenty of Steelers fans, some of whom will be on Tampa this Sunday. The Steelers have a tremendous national following. That’s what five Super Bowl rings do for a team. I’m rooting for a good game, a close game, an exciting game. I’m rooting for overtime. We’re long overdue for another. And remember, if Super Bowl XLIII goes into overtime, you heard it here first. 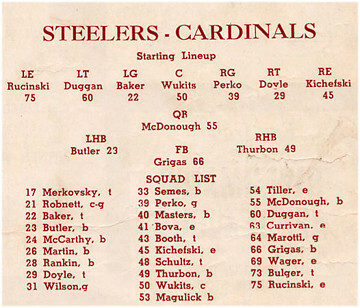 Once upon a time, the Cardinals and the Steelers were the same team. Now they’re Super Bowl combatants. In 1944, the Chicago Cardinals and Pittsburgh Steelers were forced to merge because of a shortage of players during World War II. The team was known as Card-Pitt and they were terrible, finishing 0-10, tying the Brooklyn Tigers for the worst record in the NFL. Other NFL teams walked all over Card-Pitt so often that they were called the Car-Pitts (carpets). Card-Pitt held the lead in only two of 10 games that year, and was outscored 328 to 108. Card-Pitt punters averaged just 32.7 yards per kick, an NFL record that still stands today. They played home games in Comiskey Park and Forbes Field. Chicago’s Phil Handler and Pittsburgh’s Walt Kiesling, later elected to the Pro Football Hall of Fame, were co-coaches. The Cardinals were caught in the middle of a four-year spiral during which time they lost 29 straight games. In 1945, they finished last in the NFL West with a 1-9 record, beating only the Bears. Three years later, in 1947, the Cardinals beat the Philadelphia Eagles, 28-21, for their first, last and only NFL Championship. The Steelers went 2-8 in 1945, good for last in the NFL East. They beat the Giants and later in the season shut out the Cardinals, 23-0. It took the Steelers nearly 30 years to win their first NFL title, when the beat the Minnesota Vikings, 16-6, in Super Bowl IX. The Steelers went on to win four more Super Bowls, tying the Cowboys and 49ers with five Super Bowl rings. John Updike, one of the great American men of letters, has died at age 76. Updike wrote 61 books in all, perhaps none better than his quartet of books about Harry “Rabbitt” Angstrom. Updike traces Rabbit’s American middle-class life from his days as a high school basketball star through a loveless marriage until his final days. Rabbit Run, Rabbit Redux, Rabbit Is Rich and Rabbit At Rest. Updike’s famous essay on Ted Williams final at-bat — Kid Bids Hub Fans Adieu — is one of the greatest pure examples of sportswriting in 20th Century America. It was published in the New Yorker magazine on October 22, 1960. From the very first line, “Fenway Park, in Boston, is a lyric little bandbox of a ballpark,” the author beautifully describes the setting and captures the reader’s attention. Updike describes Williams’ career in Boston, shortened by not one, but two turns of military duty. He talks of Ted’s arrogance, his excellence as a hitter, the comparisons to Babe Ruth and Ty Cobb. “The affair between Boston and Ted Williams has been no mere summer romance; it has been a marriage, composed of spats, mutual disappointments, and, toward the end, a mellowing hoard of shared memories,” wrote Updike. Jack) Fisher, after his unsettling wait, was wide with the first pitch. He put the second one over, and Williams swung mightily and missed. The crowd grunted, seeing that classic swing, so long and smooth and quick, exposed, naked in its failure. Fisher threw the third time, Williams swung again, and there it was. The ball climbed on a diagonal line into the vast volume of air over center field. From my angle, behind third base, the ball seemed less an object in flight than the tip of a towering, motionless construct, like the Eiffel Tower or the Tappan Zee Bridge. It was in the books while it was still in the sky. (Jackie) Brandt ran back to the deepest corner of the outfield grass; the ball descended beyond his reach and struck in the crotch where the bullpen met the wall, bounced chunkily, and, as far as I could see, vanished. Gods do not answer letters. How good is that. As it turned out, the home run was Ted Williams 521st, and the at-bat his last in the majors. He decided not to accompany the Red Sox to New York for their season-ending series with the Yankees and retired..
John Updike rests now, as do Rabbit and John Updike. LeBron James would be a perfect fit with the New York Knicks. You don’t know me, but you should read what I have to say. Or better yet, what New York basketball fans have to say. Please come to New York. Come to the Knicks. Oh, you could be comfortable and stick with Cleveland, a nice team in a rust belt town. You could see if the Lakers or Celtics could get under the cap, perhaps try to continue the winning tradition in San Antonio or Detroit, somewhere like that.. But if you want to live up to the nickname King James, if you really want to be the King, you’ll come to New York. LeBron, New York is the place to be. To quote Sinatra, if you can make it there, you can make it anywhere. You’ll have more business opportunities than you can imagine. Your profile will be elevated to another level. There’s plenty of money here in Manhattan. Salary cap. What salary cap? Isiah Thomas complained about it for years, Donnie Walsh took care of the problem in 15 minutes on a Friday afternoon last November. The Knicks have already made room for you, two years ahead of time. And if you win a championship in New York, you will be set for life in the most important city in the world. Lead the Knicks to the promised land, and you’ll never have to buy another meal or a drink in this city. But don’t ask me, ask the guys that have been there, done that. Make sure to speak to Walt “Clyde” Frazier, the Captain Willis Reed and Senator Bill Bradley about what it’s like to win an NBA championship in New York. Ask them to tell you about May 8, 1970, when Willis walked on the court to a deafening ovation and Clyde played the game of his life to help the Knicks beat the Lakers for their first championship. Those Knicks, and the Knicks that won a second title three years later, are still revered in New York sports lore, still remembered 36 years after those championship runs. Yeah, talk to those Knicks and their fans who’ve experienced that Garden electricity and the buzz that envelops Madison Square Garden, the world’s most famous arena, during a big game. Ask guys like Joe Namath or Mark Messier, who guaranteed victory for their New York teams and then delivered. Ask Eli Manning, whose Giants won over this city in February with an improbable Super Bowl victory and turned jeers to cheers. You’re a Yankee fan LeBron. Ask Derek Jeter and Mariano Rivera what it was like to wear the pinstripes in the late 90s, when the Yankees owned the world…and more importantly, owned New York. New York is a sports town, and basketball is the city game. It’s a perfect match. So LeBron, come to the Knicks and you can have all that. Come here and win a championship and you will be king for life. King of the biggest, most important city in the world, the center of the universe. It’s there for the taking, LeBron. Now that Rickey Henderson is in the Hall of Fame, voters should focus their attention on another great leadoff hitter and base thief, Tim Raines. Other than Henderson, the greatest leadoff hitter ever, “Rock” Raines is the best leadoff man in the past quarter century and more. Another great leadoff hitter, Lou Brock retired in 1979 — the same year Henderson and Raines began their careers. Pete Rose retired in 1984, but that’s another story. Raines, shown below, numbers are eerily similar to those compiled by the Hall of Famer Brock during his stellar 19-year career. Raines actually leads Brock in the Triple Crown stats, career batting, home runs and RBIs. Brock had more runs, hits and stolen bases, but also played more games than Raines (2616 to 2502). Significantly Raines drew 1330 walks during his career, nearly 600 more than Brock (761), a key barometer of leadoff hitting success. Brock played for three seasons with the Cubs before being traded to the Cardinals for Ernie Broglio, among others. He played his final 16 season in St. Louis. Raines spent most of his career in the obscurity of the Montreal Expos, and later played with the White Sox, Yankees, A’s, Orioles and Marlins. Brock, at right, led the National League in stolen bases eight times ((1966-69 and 1971-74) and set the all-time records for steals in a season (118 in 1974) and career (938 total) before those marks were broken by Henderson. Raines led the league in steals from 1981-84, and also won a batting title in 1986, hitting .334. Neither Brock nor Raines ever won an MVP or Gold Glove. Raines finished eighth in the Hall of Fame balloting this year with 122 votes, down 10 from the support he received last year. The only non-pitchers to finish ahead of Raines were Henderson, fellow new inductee Jim Rice and Andre Dawson. Raines is fifth on the all-time stolen base list. Henderson, Brock, Ty Cobb and Billy Hamilton, the four players ahead of him, are all in the Hall of Fame. The Rock should be a lock with Brock and Rickey already enshrined. Today, of all days, we are reminded of all those who made Barack Obama’s Presidency possible. We remember Abraham Lincoln and his Emancipation Proclamation, which abolished slavery and saved the Union. We think of Rosa Parks, whose act of defiance on a segregated bus spurred the Civil Rights movement. Or Medger Evers, a civil rights activist, murdered by a member of the Ku Klux Klan. Or James Meredith, the first African-American student to attend the University of Mississippi. 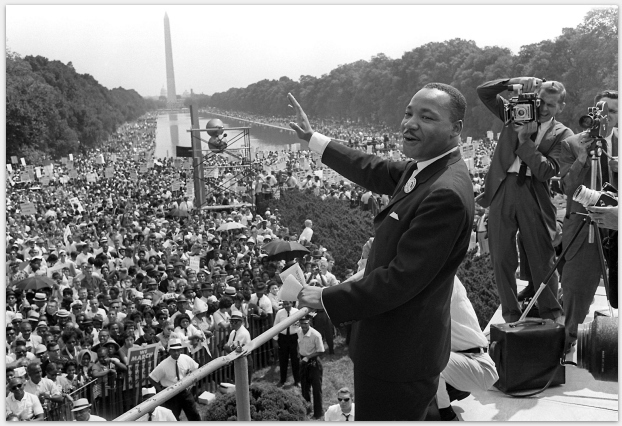 Our thoughts go back to Martin Luther King, who had a dream in the summer of 1963…a dream that came true today. We think of places like Gettysburg and Selma, Alabama, and Washington, D.C.
We recall Jackie Robinson, who broke baseball’s color barrier in Brooklyn in 1947. Or Fritz Pollard, one of the first black players and the first black head coach in the National Football League. We think of the countless thousands of Americans who made today possible. Americans today are bursting with pride and hope, eager to turn the page and make this nation great again. “Starting today, we must pick ourselves up, dust ourselves off, and begin again the work of remaking America,” said President Barack H. Obama in his moving inaugural address.